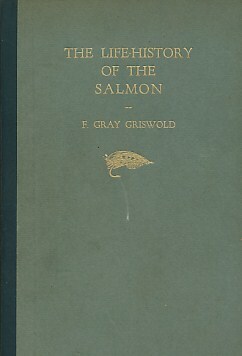 Barter Books : Griswold, F Gray; Hume, R D : The Life History of the Atlantic and Pacific Salmon of Canada. Signed copy. Frontis map and b/w plates. 210 x 140 mm (8 x 6 inches) - xii, 179pp. Quarter green cloth spine with green hardback board cover with gilt fly motif. G : in Good condition without dust jacket. Cover lightly rubbed. Slight darkening to page ends. Inscription on fep. Teg. Signed by F. Gray Griswold on title page with stamp 'For propaganda in Canada'.